Despite the fact that there’s a mere dusting of snow outside on the crisp, frozen ground, we are indeed entering the depths of winter. The days are now misty and grey, and everyone has a runny nose. Most days here at home are started and ended with a warm fires in the living room and hearty meals in the kitchen nook. We wake in what feels like the middle of the night, everything black and glowing, having gone to bed rather early the night before. And I must say, as someone who quite likes the feel of her cozy bed, it feels pretty nice getting up to see the sun rise with my babies however groggy my eyes may appear. It really sets the tone for our day together and gets everyone gathered, most always around the comforts of food or fire. Warm, simple pleasures are most welcomed this season. And with those hearty meals I’ve mentioned, we’ve added homemade rustic bread to just about every one. Have you made Mark Bittman’s no knead recipe before? It’s a complete game changer you guys. You will walk away feeling pretty fancy for mixing together just a few ingredients because what results is the pillowiest (?) most wonderful bread. I baked it for Christmas Eve to pass around with our meal and it was gone before supper hit the table! We spread salted Irish butter over it while it was still warm, and it was something special. Although quite fearless in the kitchen, I can be rather reserved on the baking front. This particular recipe has made me much more confident in that area of my culinary skills, and has expanded my horizons into trying other homemade delights. Perhaps I’ll give cheese a go next? I’ve just started making variations of this yummy bread by adding different cheeses and herbs and seeds. Sharp cheddar and rosemary was a huge hit. So was jalapeño and sunflower seed. It’s really a no fail recipe and is a wonderful one to do with eager kitchen helpers, of which I’ve got a few of. Now I’ve gone on blabbering about bread when I was going to tell you about our new art center! That was a worthy side note, nevertheless. Here’s the recipe if you’re wanting to give it a try. Given that our activities have been pretty limited to the indoors these past few weeks, we’ve created a little art area in our home just for the kids. 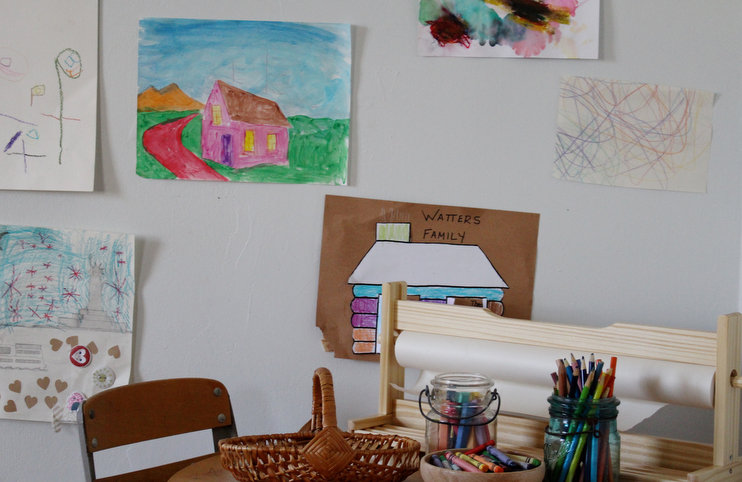 It’s their very own art station—a place to make beautiful messes with finger paints and colorful charcoal and wax crayons and watercolors and chalk. 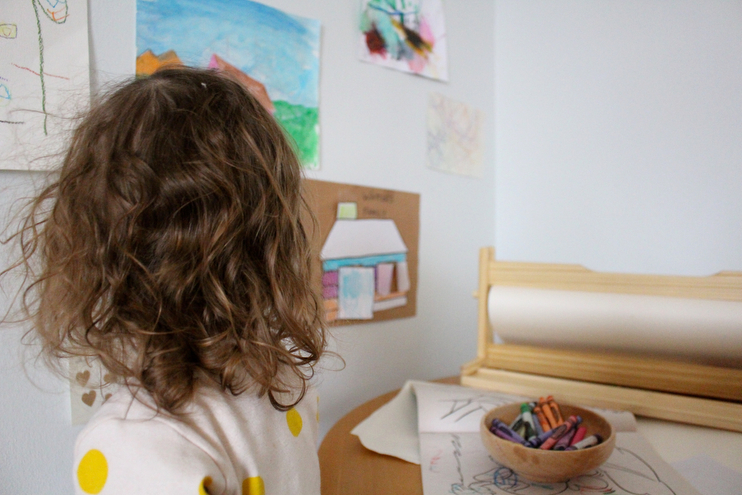 A corner of our home to let our little ones make things when they feel called to do so, something we as parents feel is a good way to cultivate creativity and foster exploration for their budding imaginations. Before making this area we had all of our art materials tucked away and out of sight. We still have about half of our art supplies in the cupboard, but now we’ve selected a few to keep on the table so they can take to making things when they choose. Of course, there’s the obvious probability that things will get drawn on with their supplies being so easy to get to, but you know, we’re okay with that. There’s nothing that hasn’t gotten a bit tattered or roughed up by the kids already. What’s a few scribbles or paint stains if they are able to let loose and nurture their creativity? That’s what being little is all about! I am a pretty creative soul and we’ve always been big into making art over here. That being said, something was getting in the way of them discovering on their own, which is what we’ve always encouraged on the creative front. Taking a Montessori approach, we’ve made our kids space that is just their size and proudly displays what they’ve made that week. It has been really wonderful watching them gravitate to this imaginative corner and create when feeling the urge to express themselves. We also delight in filling up a part of our home with pieces they’ve made. I just framed a few pieces they made the other morning and huge them up with wire. Little Theo told me he was making “laloons” (balloons) which was basically circle swirls and Stella drew our family. Man, kid art is really the best. I encourage you to make an art station for your little creators if you’ve not already done so. If anything, it’s a fun way to get you through this cold, winter season of hibernating indoors. 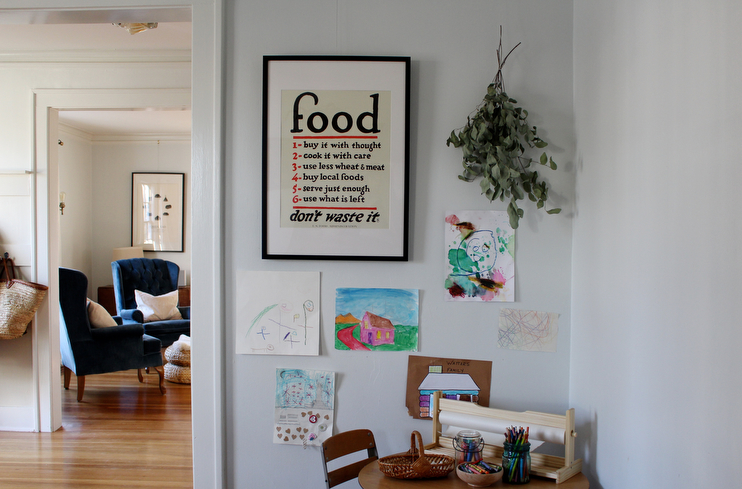 I am wondering where you got your vintage food poster?? Its perfect!